Cancer is a complex beast. It’s hard enough to treat when it sits in one location. But when it sends out “pioneers” to move to more “fertile ground” – the process called metastasis — it destroys some 90 percent of its victims. That makes metastasis perhaps the most evil word in all of medicine. If you can confine cancer to the place where it originally started, your chance of beating it is much, much better. I can almost (but not quite) say cancer is no big deal until it metastasizes. Scientists are confident that if they could get a grip on what actually happens in the process of metastasis, what signaling mechanisms are triggered and how to stop them, cancer would no longer be the killer it is today. So what are the key players in this process? How do rogue cancer cells decide where to resettle? And are there natural ways to stop metastasis before it begins? In order to understand what happens during metastasis, let’s use a metaphor. Imagine that all the cells in a primary cancer make up one large family unit that lives together in a single location and functions as a whole. But suppose that, as time goes on, some cells rebel and run away from home. They find a way to break out of their home, then seek a blood vessel that allows them to travel freely throughout the bloodstream. It’s kind of like hopping a train… then eventually hopping off and forming a new outpost where they can begin to multiply. Fortunately for cancer patients, this process isn’t quite as simple as it sounds. It has its share of obstacles. Less than one in 10,000 cells actually succeed in creating a new tumor at a remote site. In such a tightly knit community, these runaway cells must first wrestle free from neighboring cells and supporting membranes. Then they have to be strong enough to weasel their way into a nearby blood or lymphatic vessel. Normally, if a cell can’t hitch a ride to the blood vessel on what’s known as the extracellular matrix (ECM), it dies via programmed cell death or apoptosis. Joining the ECM provides the path of least resistance for migration. It’s a supportive medium, creating biologically active molecules that promote angiogenesis (the creation of new blood vessels that help grow cancer). These cells eventually lodge in the capillaries of other organs, then enter those organs and begin creating new tumors. In other words, cancer’s ability to flourish in foreign (new) tissues involves a complex set of survival factors – the escape, an accomplice, the journey, linking to a new tissue type, and creating new blood vessels to supply nutrients. What attracts these cells to resettle in a given site? 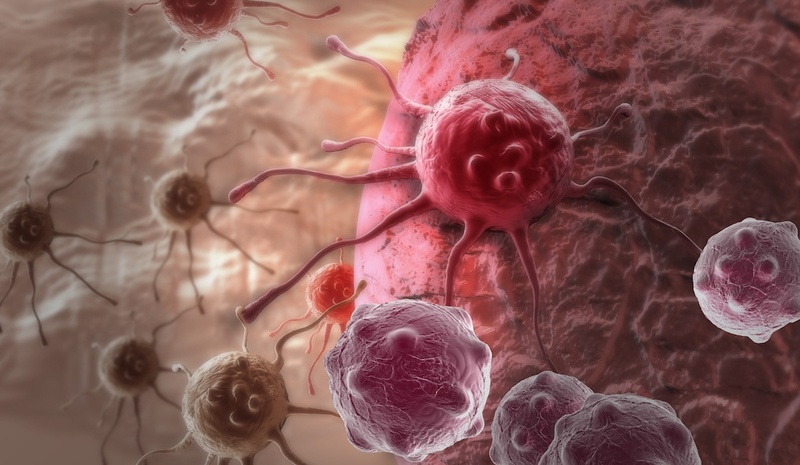 Cancer cells seem to prefer certain sites. The architecture of the circulatory system and normal blood flow routes largely determine where runaway cells decide to set up shop. Cancer cells often establish their new homes downstream from their original location. For example, prostate and breast cancers often move to the bone. Lung cancers frequently seed new tumors in the adrenal glands. This homing inclination may correlate to the receptiveness or repulsiveness of the new terrain. If there’s a mutual affinity between the “soil” and cancer cells, it spurs angiogenesis, the growth of blood vessels that deliver nutrients to the cancer cells, aiding tumor growth. Is this why cancer doesn’t like exercise? Blood flow rates may be linked to exercise, though the link is unclear at this time. However, it is a known fact that exercise improves cancer outcomes. Exercise physiologist Brad Behnke from Kansas State University studied prostate cancer tumor growth in sedentary versus active rats. Like humans, rats divert blood flow to muscles during exercise, resulting in a 200 percent increase in tumor blood flow during exercise. That actually sounds like a bad idea. You might think the generous amount of blood would feed tumor growth and accelerate metastasis. But according to Behnke, that’s the opposite of what actually happens. As he reported in Runner’s World Newswire, it’s when a tumor runs short of oxygen that it releases nearly every growth factor we know about (and probably some we’ve yet to discover). On the other hand, when a tumor is bathed in oxygen, its activity slows. Behnke’s study showed a 90 percent decrease in low oxygen levels when rats participated in moderate long-term exercise.2 This fits in well with the belief of most alternative cancer experts that oxygen is lethal to cancer. Cancer thrives in a low-oxygen environment. Another study showed that aerobic exercise normalizes the tissue microenvironment, helps return it to its pre-tumor status, and halts growth of aggressive metastasis.3 While many people know exercise is good for your heart, I think too few know it protects you from cancer, too. Platelets play a key role in blood clotting, keeping you from bleeding to death from a simple injury. But cancer cells cause platelets to malfunction by enticing them to clot around the cancer cells. This adds a cloak of protection against your immune system and enables the cancer to spread to remote areas unseen. Although everyone’s quick to blame genetics in cancer, scientists think it’s unlikely that a single genetic defect could trigger metastasis. It’s far more likely that numerous deviant genes each contribute to it. And you can often affect gene expression for the good. In a study of breast cancer with metastasis to the brain, scientists found that 17 genes were involved. Six of those genes were also found in breast cancer metastasis to the lungs. Our research turned up a number of other triggers that affect whether cancer metastasizes or not. Another study condemned neutrophils as bad guys. It’s true that they’re the most abundant immune cells in our bloodstream, and thus protect us from infections and help heal wounds. But cancer patients tend to amass a glut of neutrophils. In mouse tumors, excess neutrophils played a key role in promoting the spread of cancer to distant organs. In a meta-analysis of 18,000 human tumors spanning 39 types of cancer, neutrophil inflammation was linked to a high probability of metastasis and poor outcomes. The as yet unanswered question is whether neutrophils are merely innocent bystanders or the driving influence on cancer spread. Instead, do what you can to right the ship. Do your best to restore equilibrium and balance in your body. Battles aren’t won by giving up. You already know that metastasis is far more likely to be deadly than the original cancer. So instead of attacking the cancer, try to control its spread. You have more tools at your disposal than you might think… good food choices, exercise (as noted), and all the other things we talk about in this newsletter twice a week. It’s important to understand that cancer is not a one-trick pony, but a major sign that several things are wrong in your body as a whole. So give your body the TLC it deserves. Don’t focus your energy and efforts on the one “sick organ,” but on system-wide healing protocols that can stop metastasis and save your life.